Chromium, the metallic element once believed to be toxic, is now generally recognized that when used as part of your diet, to play an important role in maintaining a healthy blood sugar level.In addition, supplemental chromium has been shown to promote a healthy cardiovascular system. 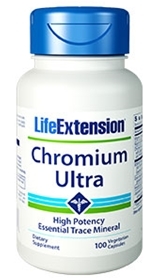 For many years, Life Extension has included niacin in its chromium supplements. In response to evidence that people may benefit from higher does of chromium, a formula has been developed that provides 500 mcg of chromium along with 60 mg of flush-free niacin in just one capsule. To provide full-spectrum benefits, the antioxidants and gene-protecting nutrients like curcumin, resveratrol and green tea have been included. Other ingredients: rice flour, gelatin, magnesium stearate, silicon dioxide. Contains soybeans. Contains rice. This product contains NO milk, egg, fish, peanuts, crustacean shellfish (lobster, crab, shrimp), tree nuts, wheat, yeast, gluten, or corn. Contains NO sugar, and no artificial sweeteners, flavors, colors, or preservatives. Take one to two capsules daily with meals, or as recommended by a healthcare practitioner.